NM Ian Harris was the favorite in quad one entering the tournament. However, it was Ryan Young who, armed with excellent opening preparation, surprised the field to win all three games and get within striking distance of becoming a master! Meanwhile in a very tough second quad, Dennis Li also won all three games to take home top honors. 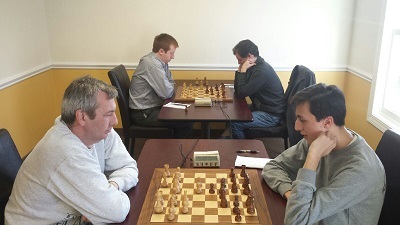 Quad three was a two way tie between Derrick Xiong and Liam Kaufman after Kaufman managed to defeat Xiong in their last round encounter in order to catch up. 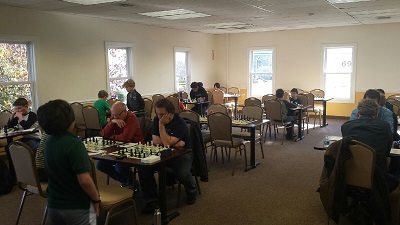 CCFC regular Justin Paul breezed through the competition in today’s fourth section, a six player swiss. He finished with a perfect 3/3 while Eric Fisher finished in second with 2/3. Alexander Kupersmith was the final winner of the day, winning all three games to win quad five.